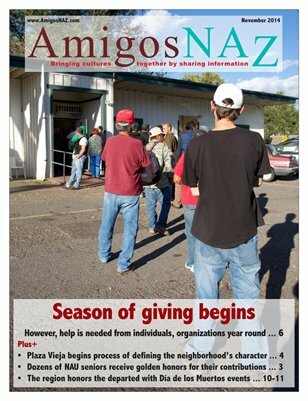 The November 2014 edition of AmigosNAZ begins with a cover story on the traditional season of giving as monetary, food donations and volunteers increase during the holiday season. While appreciated, officials say help is also needed year round. The edition also includes a commentary on the series of public meetings scheduled to help update La Plaza Vieja’s Neighborhood Plan in Flagstaff to address student housing, traffic and other issues; information on awards given to Northern Arizona students, information on a food bank benefiting students at NAU, photo pages highlighting local Día de los Muertos celebrations, a commentary on Social Security beneficiaries, tips on how to use diet to supplement your workout routine and how to figure the best turkey-to-person ratio. All this, and a calendar of upcoming events in the region, brought to you by AmigosNAZ — Providing information for and about the vibrant Latino community in Northern Arizona.